An RO system features 2 or 4 stage filtration panels through which water is passed before declaring it pure for drinking purposes. Each filtration panel is designed with its own special purpose to purify the impurities from the water like dissolved particles, chlorine and other soluble compounds. The Reverse osmosis membrane is located at the final filtration panel and works to purify water from micro-particles and serves the purpose of de-chlorination as well. This membrane is the most sensitive part of an RO system, which decides the percentage of pure water acquired from a Reverse Osmosis system. Therefore, it requires regular cleaning and maintenance routine in order to keep the RO membrane in good shape and prevent unnecessary clogging. With proper maintenance of an RO system membrane, you can add years to its life, however, it is generally recommended to change the membrane every 2 or 3 years. A Reverse Osmosis membrane can be installed easily at home by following proper guide and installation instructions. Here are the detailed steps for changing, and installing a new Reverse Osmosis system membrane. First of all, turn off the water supply to your RO system and let it settle down for a while. Take off the tubes connected to the membrane unit and unscrew the membrane cap from larger side. It is very crucial to empty your RO system carefully and to stop the water supply so that you can avoid getting all work messy. Once you remove the membrane cap, you will be able to remove the membrane. Take it out carefully and discard it immediately. While removing the membrane, make it sure you don’t damage or unscrew other parts. 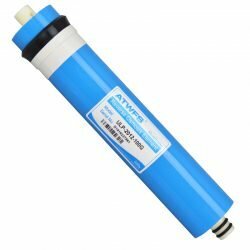 It is recommended to replace all other filter cartridges as well, when changing the RO membrane, so that the new membrane doesn’t get contaminated with previous remains of impurities present on old filter cartridges. In that way you will have a clean and clear overall system that will have no impurities or flaws in the whole process. Sanitizing the whole system at the time of replacement of membranes and cartridges is also recommended. Hydrogen peroxide is commonly used for the sanitation of RO systems. Make sure to drain out the water completely from the RO system during the sanitation process. It is very important once you have added hydrogen peroxide to the system. Insert new membrane into the old membrane housing and make sure that it is properly fixed at the lower end. Put on the membrane cap and screw it gradually while ensuring the accurate positioning of “O” ring. This will ensure that you have got the membrane fixed and there will no leakage or faults in the future. Re-connect all the tubes connected to the RO membrane housing unit. Be sure, to fix it with the proper tightness and they should hold together firmly, as it will affect the overall filtration process. Once you connect back the RO system properly, run cold water through it and check for any leaks. In case of leakage you may have to tighten up the parts again. This step is important because it will have a direct effect on the amount of water being filtered as well as the tie taken to compelte each cycle. Let the tank fill with cold water completely and then completely drain out this water in order to flush out any impurities found during the replacement process. Once you have drained out the first batch of water from the RO system, fill the storage tank again with water and use it for drinking purposes. For the first few days after replacement, you might observe some leakage in your RO system which can be easily fixed by re-tightening the parts together. Or if you have doen it correctly there may be no issues at all. Installing a new membrane into the RO system is pretty simple yet it requires proper instructions which must be followed carefully. Regular cleaning cycles must be observed after the replacement of cartridges and membranes in order to protect your Reverse Osmosis system for a quick build up of residues and prevent other problems associated with the RO system.